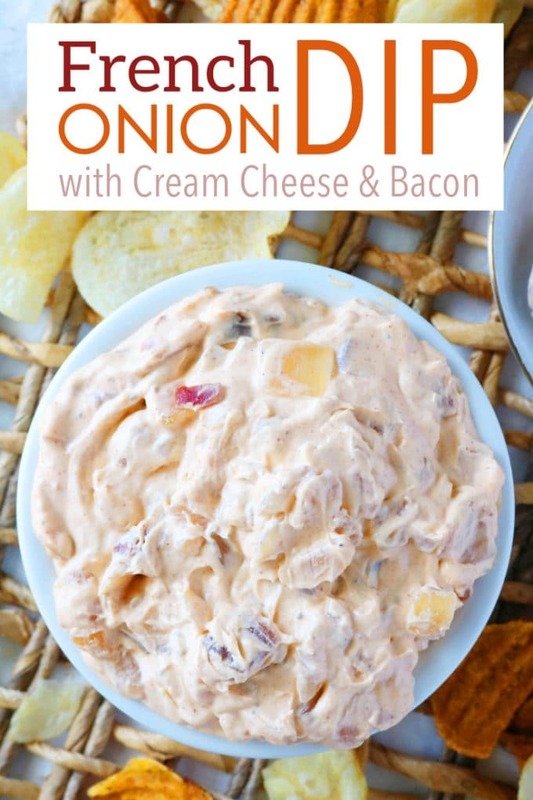 An easy homemade French onion dip recipe featuring sautéed onions and crispy bacon! 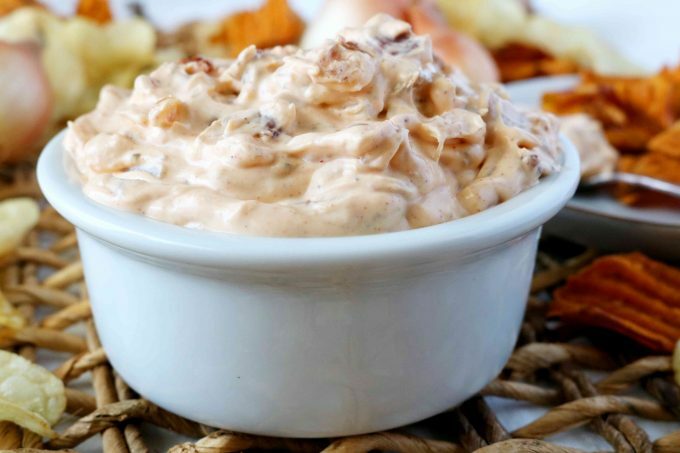 This onion dip is guaranteed crowd-pleaser, perfect for parties, potlucks and backyard BBQ’s! I am always on the hunt for a dip that’s simple enough to make, yet tasty enough to keep my guests coming back for more. This French onion dip recipe with bacon meets both of those requirements and then some. Think French onion dip with cream cheese and bacon. How can that be bad? Simply put — it can’t. This recipe takes French onion dip to the next level and was created to impress your guests. Rather than using a packet of dried spices (or really, just dried spices in general), this recipe incorporates real ingredients like slow-cooked onions and thick-cut bacon. Real ingredients often equals real big flavor. This recipe is no exception. 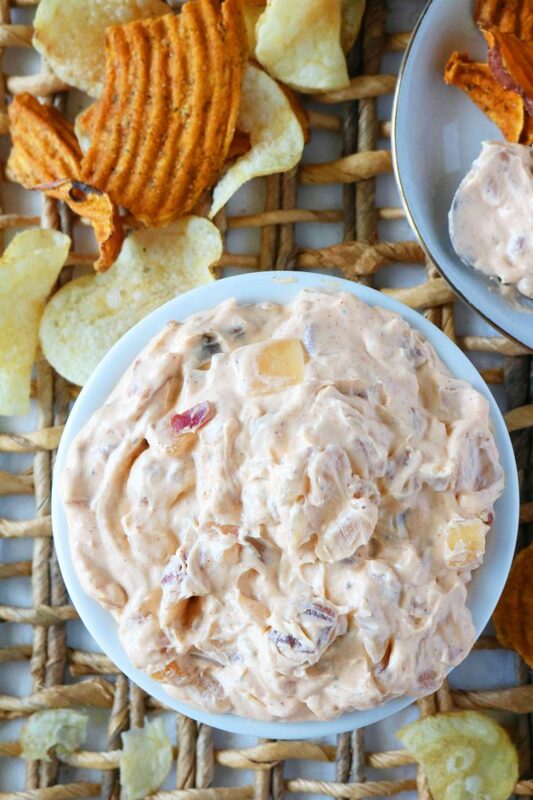 You can pull out this dip any time of year, and it’s great for backyard BBQ’s in the summertime and absolutely perfect for fall entertaining alongside some spicy sweet potato chips. So how do you make a french onion dip from scratch? It’s really quite easy, and it begins just the way one thinks it might — with onions. Most French onion dips will call for a mix of sour cream, dried onions, and onion powder. 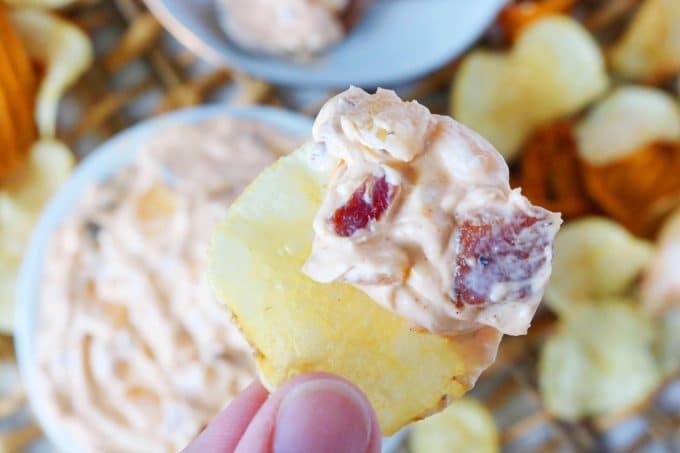 It’s a tangy, savory dip perfect for dipping classic potato chips and kettle chips. For a french onion dip recipe with a little more body and a whole lot more flavor, I’ve incorporated not only cream cheese into the mix but real, caramelized onions and crispy, thick-cut bacon. This souped-up French onion dip recipe begins with pan-seared bacon. Then, onions are sautéed in the leftover bacon fat until softened and extra sweet. They are mixed into the base of the dip which (in this case) consists of sour cream, cream cheese, and mayonnaise. The sour cream gives the dip its signature tang, cream cheese adds body, and the mayonnaise keeps it nice and smooth. The secret weapon flavor bomb comes in the form of a 1/2 teaspoon, but though it is small, it is mighty. 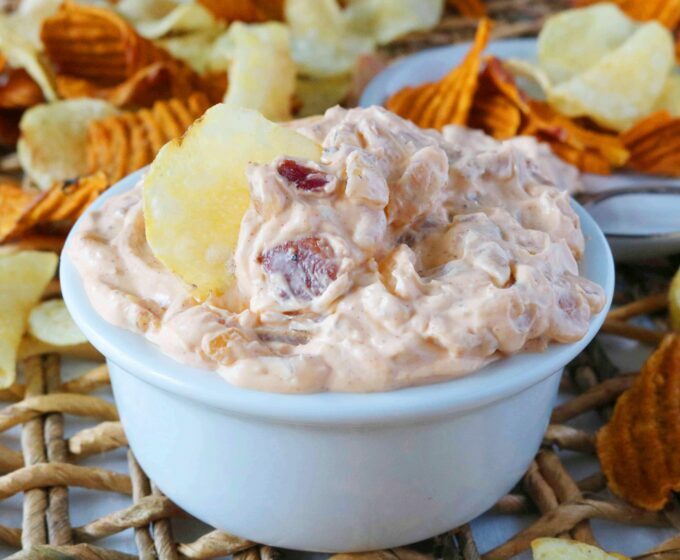 Smoked paprika adds a subtle smoky note to this dip, takes savory to the next level, and pairs perfectly with caramelized onions and bacon. It’s a French onion dip souped up with cream cheese and bacon, and the reward far exceeds the amount of labor involved: A little sautéing, and a moment of mixing is all it takes. I’ve served this dip countless times now, and it is a surefire crowd pleaser, always bringing in an abundance of compliments, and going out with an empty bowl. Serve with sturdy sweet potato or kettle cooked chips, and enjoy! 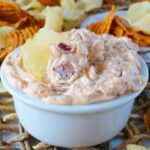 Easy Bacon Cheddar Ranch Dip is a total crowd-pleaser that comes together quickly and can be served with vegetables or potato chips. Lox Spread is a flavorful cream cheese dip featuring smoked salmon and capers. 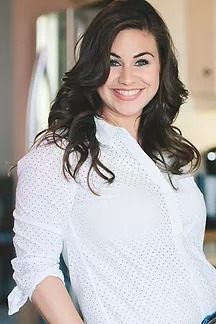 It’s perfect for brunches and cocktail parties! Dill Dip is a classic party dip that is fresh, tangy and full of flavor thanks to the simple additions of spices and herbs. The best part? It comes together in just 5 minutes. Whether you serve it on a vegetable platter or alongside potato chips, you can rest assured — the crowd will be sending droves of compliments your way. Cheesy Spinach and Artichoke Dip is cheesy baked dip that keeps guests coming back for more! Artichoke Jalapeño Dip is the perfect combination of savory and spicy and features flavorful marinated artichokes, minced jalapenõs, and freshly grated Parmesan cheese. An easy homemade French onion dip recipe featuring sautéed onions and crispy bacon! Sauté the bacon in a large sauté pan over medium-high heat for about 10 minutes, or until browned and crisp. Turn off the heat. Remove the bacon from the pan with a slotted spoon, leaving behind the grease. Add oil and place the pan over medium heat. Add the onion and sauté for 15 minutes, making sure to stir occasionally. Remove from the heat and set aside to cool. In the meantime, add the cream cheese to a medium-sized mixing bowl. Using a hand mixer on medium speed, whip the cream cheese until it appears smooth. Add the remaining ingredients to the bowl, and again on medium speed, mix until fully incorporated. Stir in the bacon and onions. Serve alongside kettle chips, sweet potato chips or crudités. Enjoy!